Raspberries have always been one of my favorite fruits and flavors. They are so bright, vibrant, and pretty. They're delicious. How can you go wrong? I even love the seeds! Raspberries always make me think of Graeter's black raspberry chip ice cream. For those unaware of what Graeters is, it's a Cincinnati based ice cream store. Oprah loves it so much she has the ice cream mailed to her. I admit, I'll give in and have a bite or two on occasion, is someone else buys it. It's just that good. Rich in raspberry flavor with large dark chocolate chunk pieces. I have a lot of memories attached to Graeters. I still go there a lot with friends - although now I'll get sorbet, of course. Raspberry sorbet! There is nothing better than eating some raspberry sorbet with chocolate sprinkles and enjoying the company of friends. 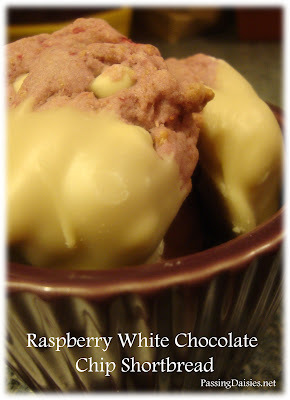 I also think white chocolate and raspberries go well together, but vegan white chocolate can be hard to find. 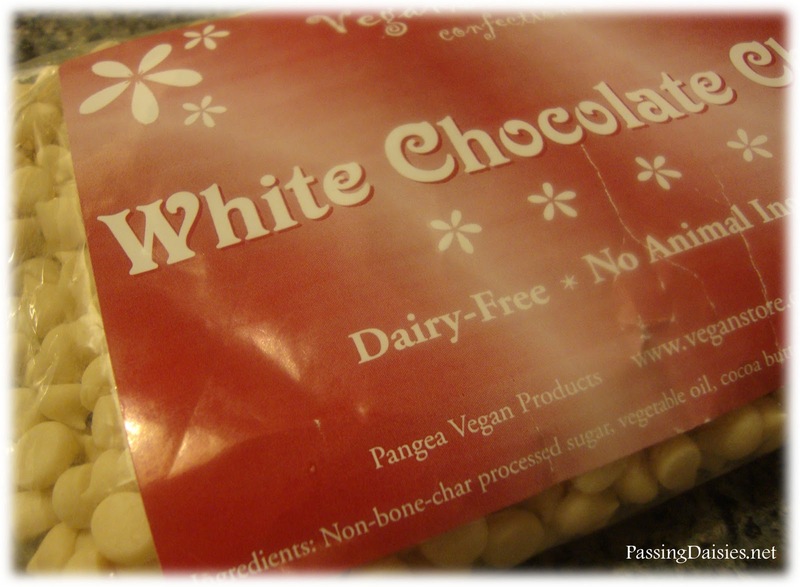 When Pangea (Vegan Store) agreed to send me a bag of their white chocolate chips to review, I was EXTREMELY excited. First, I tried them by themselves. DELICIOUS. I immediately thought it tasted like the real deal. You could fool people into thinking its regular white chocolate with these little babies (and actually, I have...I fed it to multiple friends and they still don't know!) I won't lie... I ate a couple handfuls before I got around to using them in my shortbread recipe!! Next, I wanted to try melting the chips to see how well they would melt. The verdict? They are okay at melting. It took some stirring and a good minute or minute and a half in the microwave, but it melted. Then I added some almond milk, gave it a stir, and used it as a covering to dip my cookies in. Overall? I think this is a great product and a great alternative to regular white chocolate. However, at nearly five dollars a bag, I would order two at a time. Otherwise you'll be paying more to have it shipped to you than for the product itself! Here are the cookies I whipped up using these white chocolate chips - enjoy! 1. In a large bowl, beat sugar and Earth Balance until light and fluffy. 2. Add oil, salt, lemon juice, and raspberries. Beat until combined. 3. Add flour and mix until the dough just comes together. 4. Add white chocolate chips and stir by hand until the chips has just been incorporated. 6. 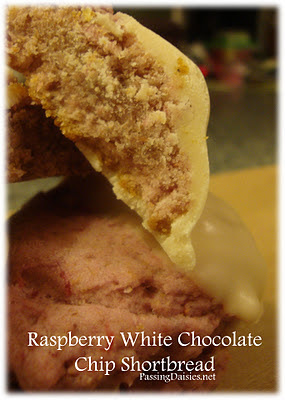 Dip cookies in melted white chocolate and place on foil to cool until chocolate has hardened. What's your favorite fruit to bake with?